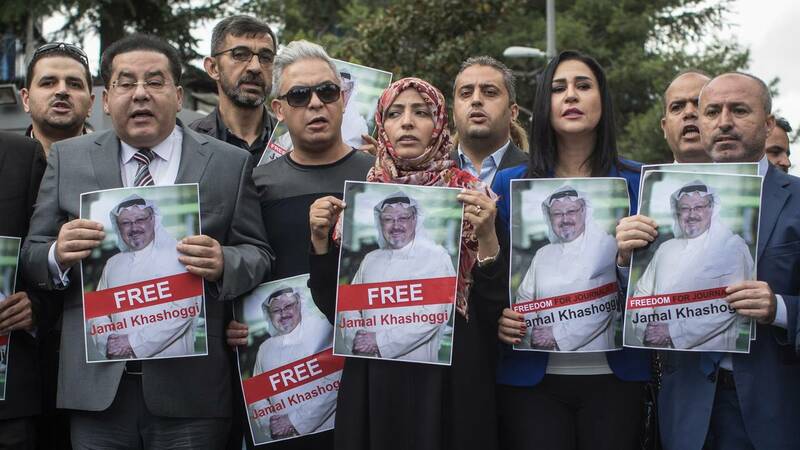 Nobel Prize winner Tawakkol Karman (5th-L) holds a poster of Saudi journalist Jamal Khashoggi during a protest outside Saudi Arabia's consulate on October 8, 2018 in Istanbul, Turkey. WASHINGTON (CNN) - President Donald Trump launched a concerted defense of Saudi Arabia for the disappearance and suspected murder of Jamal Khashoggi, saying the country's crown prince "totally denied" knowledge about the suspected death of the Washington Post journalist and complaining that the country was being assumed "guilty until proven innocent." Trump began his campaign as Saudi Arabia began to float an explanation for Khashoggi's disappearance inside their consulate in Turkey. Three sources familiar with the case told CNN that a high-ranking intelligence officer who has ties to Crown Prince Mohammed bin Salman was responsible for organizing a mission to interrogate and possibly abduct Khashoggi. It's unclear whether the Crown Prince authorized any mission. Several officials CNN has spoken with say the alleged murder could not have happened without the direct knowledge of the 33-year-old crown prince, the Kingdom's de facto ruler who is known by his initials "MBS." One source says the intelligence officer assembled his own team to interrogate and possibly abduct Khashoggi, suspecting him of ties to the Kingdom's rival Qatar. There is no evidence to substantiate Khashoggi had such ties. Trump's move to absolve Saudi leadership of responsibility is raising the stakes in a foreign policy crisis that administration officials privately describe as the most consequential of his presidency to date. Trump took to Twitter shortly after Secretary of State Mike Pompeo wrapped up a trip to Riyadh, tweeting as US lawmakers squarely blamed Saudi Arabia and said the claim that its leaders had no knowledge of Khashoggi's disappearance strained credibility. Senators and lawmakers vowed to introduce sanctions, called for the ouster of the crown prince and said that US credibility and leadership were on the line if the administration participates in what would essentially be the whitewashing of a journalist's murder on foreign soil. Not long after a Turkish official told CNN that Khashoggi's body was cut into pieces after he was killed, Trump tweeted Tuesday afternoon that he "just spoke with the Crown Prince of Saudi Arabia who totally denied any knowledge of what took place in their Turkish Consulate." "He was with Secretary of State Mike Pompeo...during the call," Trump's tweets continued, "and told me that he has already started, and will rapidly expand, a full and complete investigation into this matter. Answers will be forthcoming shortly." Later in the day, he compared the case to sexual assault allegations against recently confirmed Supreme Court Justice Brett Kavanaugh. "Here we go again with, you know, you're guilty until proven innocent," Trump told The Associated Press. "I don't like that," he added. "We just went through that with Justice Kavanaugh, and he was innocent all the way." During an interview with Fox, he said that if Saudi Arabia knows what happened to Khashoggi, "that would be bad." Trump's approach to handling the crisis with Saudi Arabia "may be the most consequential decision of his Presidency," a senior adviser to the President told CNN. The official who declined to be identified is a direct adviser on national security matters. The official's view reflects a growing concern by some administration officials that Trump may not take their advice that the Saudi regime must be held to account over the murder of Khashoggi. The White House is relying on Saudi Arabia's support to keep oil markets steady as it confronts Iran and prepares to sanction those who buy Iranian oil starting November 4. Administration officials would not have missed Saudi threats to hike the price of oil if the US took steps to punish it for Khashoggi's disappearance. Some administration officials point to the potential impact the crisis could have on the standing of US troops and diplomats overseas, while Trump has fretted publicly about the impact on US arms sales to the world's largest weapons buyer. Trump has worried that if the US were to halt arms sales, the Saudis could shift their purchases to Russian weapons. Others say that would be hard for the Kingdom to do. The Saudis still would require extensive US contractor supports for the interoperability of the weapons they already have and would not be quick to divert from US weapons. Asked about the need for Saudi support on issues like Iran, a senior US official said that while the US-Saudi relationship is "very significant to us," the administration is committed to holding those responsible "accountable." "Of course we have a longstanding relationship with Saudi Arabia that is very significant to us, but that doesn't mean in any way we are ignoring or downplaying this episode," the official said. "We continue to believe those that are responsible for it have to be held accountable. And I think that's got to be our bottom line." None of Pompeo's public appearances with the Saudis signaled any strain in the bilateral relationship. The top US diplomat appeared relaxed and smiling in photos with the King, the crown prince and foreign minister, telegraphing support and warmth far more than concern. In a statement, Pompeo said he had "direct and candid conversations" with the Saudi royals. "My assessment from these meetings is that there is serious commitment to determine all the facts and ensure accountability, including accountability for Saudi Arabia's senior leaders or senior officials," Pompeo said. The narrative emerging from sources familiar with the case seems designed to insulate the Saudi leadership from responsibility. A second source familiar with the investigation told CNN said Khashoggi may have been injected with some kind of tranquilizer and then died in the consulate. The Saudi team then covered up what they had done in an amateur fashion, the source said. A third source told CNN the mission's organizer was not transparent about what he told Riyadh, offering that as an explanation for why the government had no clear information for days. Lawmakers, who have been shown classified intelligence materials about Khashoggi's disappearance, did not hesitate to point to the crown prince. "He had this guy murdered in a consulate in Turkey," South Carolina Republican Sen. Lindsey Graham told Fox News. "The MBS figure to me is toxic," he said, and called on Saudis to find themselves another heir apparent. "This guy has got to go," Graham said. In the meantime, he added, "we're going to sanction the hell out of Saudi Arabia." The issue has created a rarely seen bipartisan unity in the fractious Congress. Graham's sanctions call was echoed others, including Democratic Sen. Ben Cardin of Maryland and Florida Republican Rep. Carlos Curbelo, who told CNN that "Saudi Arabia must understand that this is in no way compatible with our country's values and we will respond with two-thirds majorities in both chambers." Trump's new stance on Tuesday marked another turn in a narrative that has been shifting ever since Khashoggi disappeared inside the Saudi consulate on October 2. Sources have told CNN the Saudis were preparing to say that Khashoggi had died during an interrogation at the consulate. "The Saudi story, even in the last 24 hours, has been changing to where they may be acknowledging that the journalist Khashoggi was murdered, but somehow presenting the notion that it was rogue elements," Sen. Mark Warner, the senior Democrat on the intelligence committee, told CNN's Jake Tapper. "This is actually not some dark room or off some dark deserted road, this is inside the Saudi consulate and 15 individuals coming over from Saudi Arabia for what at least appears to be one task only and that was the elimination of Mr. Khashoggi," Warner said. "It strains any credibility that somehow the leadership of the Saudi regime, which is so authoritarian, wouldn't have knowledge of these actions," Warner said. Trump's advisers say one reason it's vital to hold Saudi Arabia accountable is the impact on US global leadership. They say inaction could make it increasingly difficult for the US military and diplomats around the world to argue a moral high ground on human rights. Florida Republican Sen. Marco Rubio echoed that concern, saying that the US will lose its credibility on human rights if it does not take action on Khashoggi's death. The Florida Republican said that protecting human rights was worth ending an arms deal with Saudi Arabia. "I don't care how much money it is," Rubio told Tuesday. "There isn't enough money in the world to purchase back our credibility on human rights. ... Just because a country we're working with did it doesn't mean the US can just shrug its shoulders and say nothing happened here."